In 1928 Fred Blank opened a small park in Tipton, PA after he got the idea from a traveling carnival that stopped to entertain guests at his family’s farm. The park was a small picnic park with a dance floor for special events. Later a Roller Rink was added for the younger and older crowd alike. As the years went on, the park became a popular Sunday outing for families. In 1928, the park was sold to George Rinard. Rinard added many new attractions and business was booming until the depression hit hard in the 1920’s. The rides were sold to cover costs and the park fell into a sad state of disrepair. While travelling through the Keystone State of Pennsylvania, you may notice there are an abundance of small amusement parks that are locally owned and operated. One jewel located near Altoona is DelGrosso’s Amusement Park. The park opened back in 1907 on the farm land of the Bland’s. The original name of the park was named after the Bland’s, but the park suffered majorly during the Great Depression in the 1920s. In 1946, Altoona railroad businessman, Fred Delgrosso purchased the park. All that was left of the former park were picnic shelters and tables that had seen better days. Delgrosso began investing and adding numerous additions over the next 30 years to the park. The park became an instant family gathering park with kiddie rides and other family attractions spread throughout the park. In 2000, the park was renamed DelGrosso’s Amusement Park and continues to be a success. Today the park includes two roller coasters that include a Wacky Worm and Crazy Mouse type coaster. The park thrives on the small town feel and kiddie areas. 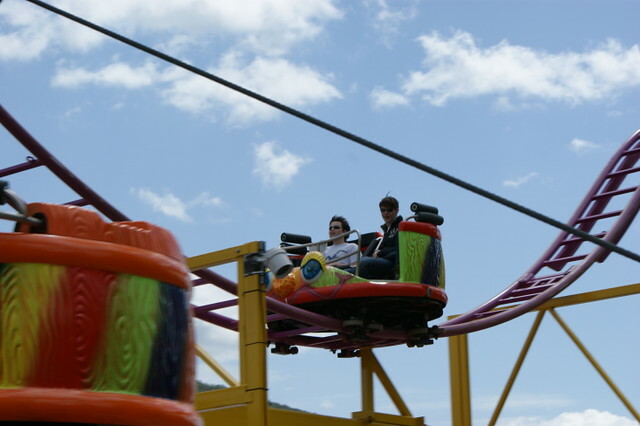 The park also includes Go Karts, Mini Golf, dozens of flat rides and kiddie rides, and fantastic shows like Summer Thunder and the Native American Pow Wow. While you are taking your big Pennsylvania Coaster Trip, make sure you stop in and show DelGrosso’s some love as well. You will not regret it.